Our guide to the best car loans and car finance options has everything you need to know to get the right deal and slash the cost of car finance. Our guide makes it easy to compare car loan interest rates and fees, and help you get the best deal to keep the ongoing repayments low. ​If you need to buy a new car and don’t have the money to pay for it upfront, car finance can be a cost-effective option to get you in the driver’s seat. In this guide, we look at the fundamentals of car financing and car loans, and reveal the best deals currently available. Shopping for a car involves visits to showrooms, searching TradeMe, classifieds and asking friends for their input, and for most people, it's an exciting time. However, few people invest the same time in finding the best car finance deal. Car financing options range from great deals to ripoffs - get the wrong financing and you could be stuck with crippling monthly payments for a long time. The right car finance for your needs is important - what you may have saved negotiating the price of your new car can easily be lost in a few months of expensive car repayments. Background: What is car finance? If you’re buying a new or used car and need to borrow to pay for it, there are two main finance options available. A personal loan – this is a loan offered by banks and finance companies that is unsecured or one that is secured against your car. A car finance agreement – this is a loan that is specifically for car purchase, and is offered by banks, finance companies and car dealers. ​With both options, you will own the car outright – this means you’ll need to insure it too unless you are prepared to risk an accident that would write off the value of your investment while still leaving you with the loan. If your loan is secured, meaning the lender as a security interest in your car, then you still own the car. However, if you become unable to make the repayments, the lender has the power to repossess your car to help pay off the debt you owe. Our guide to personal loans outlines the options available whether you are considering a secured or unsecured personal loan. Get car financing agreed in principle BEFORE you starting looking for a car – you’ll save the most on fees and interest costs and know exactly what your budget is. You can also negotiate the price you pay like a cash buyer - it makes everything easier. Without question, the WORST place to get financing is at a car dealership just after you’ve decided on a car. You have no bargaining power, nor will you be familiar with other options in the market. The cheapest interest rate deals will be on secured loans – this means the lender has a right to sell your car if you can’t make the repayments (exactly like a bank can sell a house if the mortgage isn’t repaid). To pay the least amount in car financing, you’ll need the lowest interest rate, lowest application fees and the shortest term with the most frequent repayments (i.e. weekly vs monthly). i.e. If your loan is $10,000 and your interest rate is 15%, you’ll pay $4,000+ in interest if you pay it back over 5 years, but only $1,600 if you pay it back in 2 years. 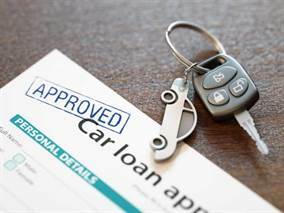 Most car loans are up to 5 years in length. Early repayment will slash the interest costs, but check the lender’s fees and charges to know how much that will cost. Avoid adding a car loan to your mortgage if you can help it – you’ll pay interest on the amount for a lot longer which costs you more in the long run. For example, a $10,000 loan at 4.50% over 25 years is much more costly than a $10,000 at 12.95% over three years. Missing repayments gets costly – lenders charge $25+ for each missed payment, so prioritise your repayments. Car Finance is a debt you agree to for the sole purpose of paying for a car. You agree on an amount to borrow, an interest rate and a term of repayment (i.e. 1 year, 5 years). Once your loan is successful, either the party selling you the car will receive the money, or you will receive it directly. The lender will register an interest in your car (if the loan is secured). You then repay the loan with fixed payments, either weekly, fortnightly or monthly. Paying weekly incurs less interest costs than paying fortnightly or monthly as there is less debt outstanding. If you fail to keep up payments the finance company is entitled to seize the car - you must be certain that you can afford the repayments before you go ahead. Once repaid in full, your car finance agreement is terminated and the lender's interest is removed. To make an informed decision, you simply need to compare the annual interest rates offered between the lenders – the one with the lowest percentage is the best deal. Fees to get the loan will vary between lender, but the interest rate is the biggest factor in getting the best loan. Pick the wrong lender and you can easily pay $100 more every week on a $10,000 car. For the purposes of this guide, we compare personal loans and car finance together (referring to it as “car finance”), as both operate near identically and the differences are largely indistinguishable to a borrower. Car finance may not suit everyone. If you have trouble paying debts in general, car finance could end up an expensive mess if you default. Most lenders offer financing that is simple to understand and arrange. Once you repay the car in full, the lender no longer has a claim to it. If you fail to keep up with the repayments the lender can repossess the car to pay your debt. Early repayment fees - some lenders charge them, but others don't. Banks - Every bank in New Zealand offers personal loans and/or car loans. Banks may offer preferential interest rates to existing customers, as well as offering the option of including a car loan in a mortgage. Finance Companies and Credit Unions - Most Finance Companies and Credit Unions offer personal loans and/or car loans. Specialist Car Financing Companies - Companies exclusively offering car finance are most visible online with big claims of offering the best deals, but it's not always the case. Car Dealerships - Dealership car finance is offered and arranged by almost every car dealer in New Zealand – it’s a lucrative side-business on top of the commission from selling cars. Buying a new car from a manufacturer-dealership? If you buy a new car, finance deals are usually arranged through the manufacturer’s car finance division, such as Holden Finance for Holden and Toyota Financial Services for Toyota. It’s definitely worth finding out what manufacturer-dealerships can offer you on a finance deal – it may be cheaper as well as easier than dealing with another lender. Buying a used car from a manufacturer-dealership? If you’re buying a used car from a manufacturer-dealer, it’s also worth looking at their in-house finance options. The interest rate you will pay will be determined by a few factors, which we detail below. Your credit history – if you have been good with previous repayments (credit cards, phones, mortgage, loans etc) you’ll get a lower interest rate than someone with defaults or missed payments. Your deposit – if you want a $10,000 loan, having a $2,500 deposit is better than having $0. How much of a difference it makes depends on the lender’s risk assessment. The car’s model - if your car is a common model, this can mean a lower interest rate, as there is an improved chance of quick resale should you default so your loan is less risky. Consider taking a shorter loan period - the longer the term of the loan, the more interest you'll pay - the table below shows the total cost of a $10,000 loan at a 15% interest rate over a 1 year, 3 year and 5 year loan term. As outlined below, the total interest cost for a 5 year loan is more than five times the cost of a 1-year loan. Put down a larger deposit – the loan size will be reduced and so will the repayments you have to make. Agree to a longer repayment period – the repayments will be smaller, but you’ll pay more in interest charges which ultimately makes the loan more expensive. Make early repayments – the size of the loan will fall and subsequent repayments will be smaller, but check the fees involved in early repayments or overpayments. If you’ve bought it from a dealer, you can take it back and ask for the problem to be sorted. New cars will usually be under warranty, and used cars bought from a dealer give buyers rights too. If you’ve bought the car privately and something goes wrong later, you are on your own – see our buying a used car guide for more details. You could be stuck with a broken down car and a loan to pay if you're not careful. Generally, missing one repayment isn’t too serious – your lender will just follow up with a reminder and probably charge a small fee as a penalty. But, if you fail to make repayments one after another, your lender will take action and start legal proceedings to repossess your car. ​The faster the lender can then sell your car, the less it will lose so your car is at risk of immediate seizure. You will also have a “default” put on your credit history. This will affect any further financing you need such as phones, other cars, mortgages etc. Your financial situation – credit card balances, savings, investments etc. Once submitted, the lender will assess your application and run a credit check on you. The lender will then make a decision and notify you; if you’re successful, you will be told the loan amount and interest rate. Before committing to any car loan or finance deal, it is essential to be cautious about what you can afford - being stuck with unaffordable monthly repayments is a fast road to misery. Get an affordable interest rate and know the charges of the contact - car finance is more than just interest; there can be hidden fees. Don't be caught out by the fine print - ask and understand everything you need to know upfront. Know the size of the upfront deposit - the more you have in cash for a deposit, the better the finance terms. If you're looking for a $10,000 car and have $3,000, you'll be able to put down 30%. This makes you more attractive to a lender than someone who can only put down 10%, and for this reason alone you can get a better deal. Check you can afford the monthly payments - our guide is to spend a maximum of 10% of your pre-tax income on your car payments. If your monthly income is $4,000 before tax, don't commit to a car finance deal that would charge you more than $400 per month. Doing so could cause financial hardship. Know how long the term is, and if you can make early repayments - the best car finance deal is the one that is flexible paying it off early. Because car finance is often high-interest, even a $100 early repayment once in a while will save considerably in the long term. Know your credit score - our guide to credit scores shows you how to do this for free, and helps you understand what's important to get cheap finance. We've put together the best deals currently available, and list their upfront fees. Each lender will assess your ability to make repayments differently, which means you will most like be offered a range of interest rates by different lenders. What matters is that you can meet the repayments, understand terms and any associated fees. The list below is in alphabetical order - the best deals are those with the lowest interest rates. A popular option is to contact a range of lenders for a non-obligation interest rate quote. Be clear on the amount you want to borrow upfront and what your income is, as well as all other loans/credit card balances you have. Do you have a solid credit history and the income to make repayments without any foreseeable issue? Interest rate: Between 9.95% to 15.95% p.a. Interest rate: Between 9.99% p.a. and 19.99% p.a. Interest rate: Between 6.99% — 29.99% p.a. Establishment or Loan Fee: $200 for loans from $2,000 to below $5,000 and $450 for loans from $5,000 to $70,000. Interest rate: Between 12.99% p.a. and 18.95% p.a. - a rate of 13.95% p.a. applies for Kiwibank Home Loan customers and Kiwibank Graduate Package customers. Turners Finance organises car and personal finance through Oxford Finance and MTF Finance. Interest rate: Between 13.95% to 18.95% p.a. Q: The lender advertised “from 9.99%”, but I was quoted a much higher, rate why could this be? A: What the lender advertises and what it offers to most people are entirely different. Your interest rate will depend on your credit history, the vehicle you are buying, your income and other factors. Q: Why is car finance so expensive compared to other loans? A: Cars, unlike property, fall in value every day, so lending money on an asset that is worth less as time goes on is high-risk. Many finance companies have gone bankrupt lending to drivers who couldn't repay their car loan, and repossessing the vehicle doesn't recover much of the value. For example, a $10,000 car after two years is probably worth $6,000, but if $8,000 is owed on the loan, then the lender takes a loss. For this reason, interest rates are high and your credit history is very important when the lender offers you financing. Q: What happens if I want to pay off the outstanding balance early? A: You can do this at any time, but check the fees you’ll pay – some lenders charge, some don’t. If you plan to repay early then it's best to look at loans that offer this free of charge. The easiest way to arrange early repayment is to contact the lender. Q: Do I need to take out insurance and where should I get it? A: Yes, even if your car finance isn't secured, having insurance protects you from financial loss if you cause damage to another vehicle. Our car insurance guide outlines the best policies available. Q: How long does it take for an application to be assessed? A: Many lenders offer same-day responses, so you'll be able to get a loan in principle for when you decide to go ahead with a car purchase. Some lenders even offer instant or same-hour approvals. Q: What happens at the end of the finance deal? A: In short, nothing changes other than you stop making your regular repayment to the lender. Any security over the car will be discharged (either for free or at a fee). This means you will be free to sell the car later on without any complications.